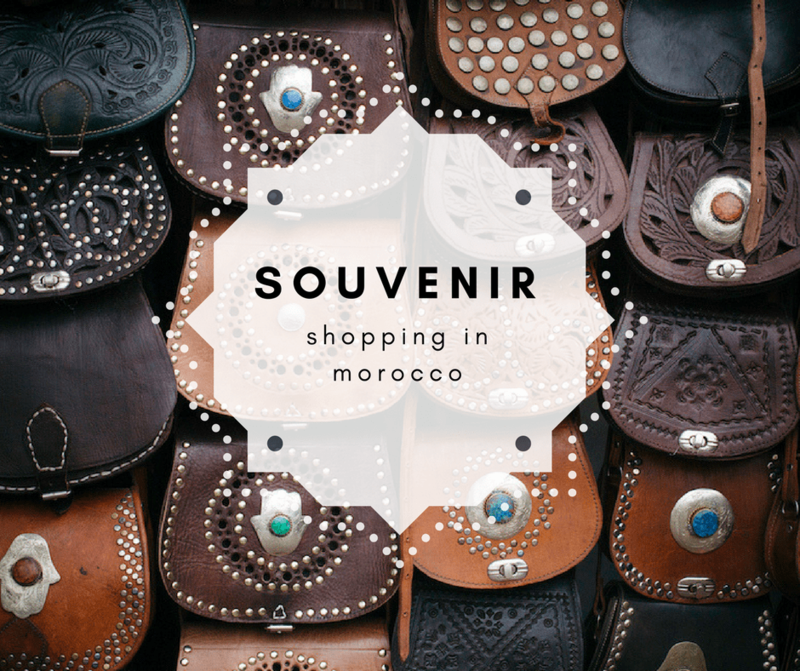 Today I’m tackling an important subject you’ve probably asked yourself while planning a visit to Morocco…what souvenirs to take home from Morocco! It’s true we have some amazing shopping but don’t worry if shopping isn’t for you. You’ll find so many amazing gifts from Morocco you’ll probably wish you’d brought a second bag. 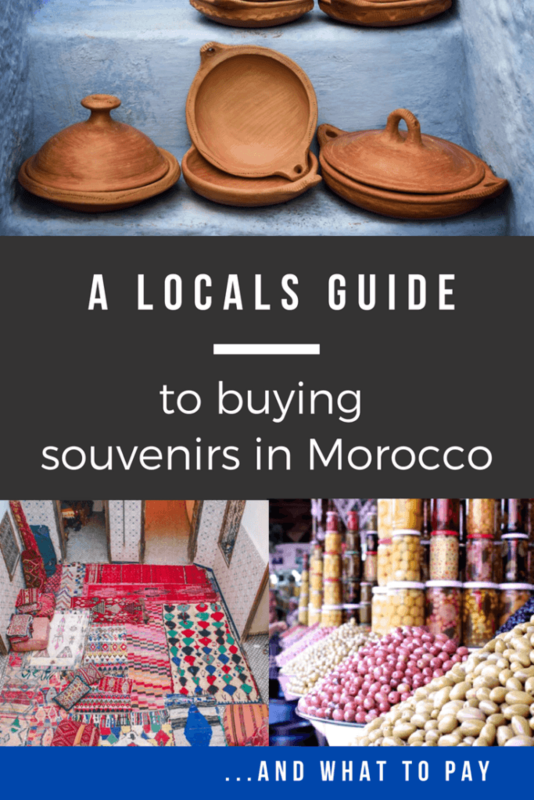 If you’re planning a visit take a read through these things to buy in Morocco that also include an idea of prices to consider while you’re shopping. Depending on where your visit to Morocco takes you will alter what you should bring home for souvenirs. While it’s true you can get most anything, anywhere there are different cities and regions that produce specific goods. For example argan oil in Tangier is going to be much more expensive, and potentially a worse quality than if you bought it in Agadir. Morocco is a shopping paradise but take care to ensure you’re getting the best quality goods possible. It goes without saying that if you’re interested in buying argan Morocco is the place to do it. If you’re wondering what is Morocco famous for? This is it! For the best souvenirs from Morocco you want something that is extra special. You can’t go wrong with argan. Argan is grown in the southern regions of the country. The oil is extracted from roasted seeds. 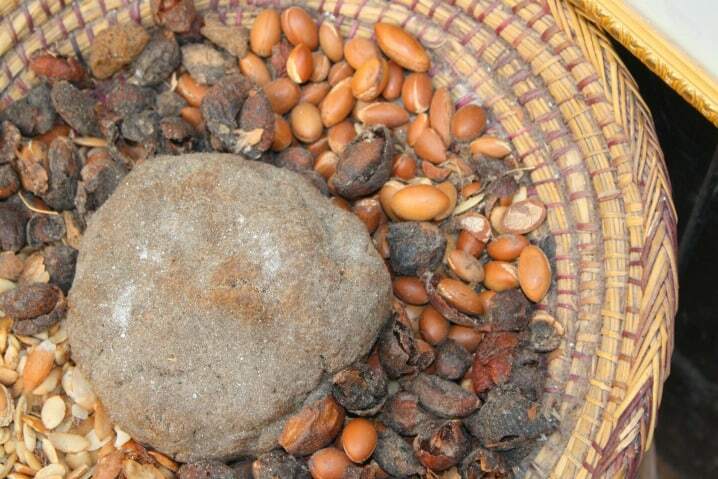 There are two types of argan; cosmetic and culinary. You’ll want to specify which you’re after. True argan is thick, a golden yellow color and smells very nutty. It is sold in bottles as just oil and you’ll also find many products with argan infused into them. Some of my favorites are argan shampoo and argan hand lotion. Remember argan is made only in Morocco so stock up while you’re here. Best locations to purchase: Agadir, Essaouira and smaller villages in the region. Price: This varies widely depending on argan production that year. For 100mL of cosmetic oil you should expect to pay at least 50-75dh up to 150dh. Culinary argan is a little more expensive. There is no doubt that you will see hundreds of different types of handmade pottery and Moroccan ceramics during your visit. Plates, bowls, cups, decorative pieces the list goes on and on. Moroccans love bright colors but there are more and more neutral tones popping up in the souks. Most cities have small shops that sell a piece or two to tourists but also have wholesale shops that sell in larger numbers. If you can find the wholesale shops you’ll have a wider selection and you’ll also likely be able to get a better deal. If you only plan to buy one or two things, the extra effort probably isn’t worth it but if you’re wanting to buy in a larger quantity it can pay off. If you are after a particular color or style don’t hesitate to ask the shopkeeper. If you’re flying you can also ask to have these items wrapped or better yet if you are planning to purchase these items add some bubble wrap to your bag. There’s nothing worse than discovering shattered pottery in your luggage. Best locations to purchase: Each city has a specific color and style they’re known for. 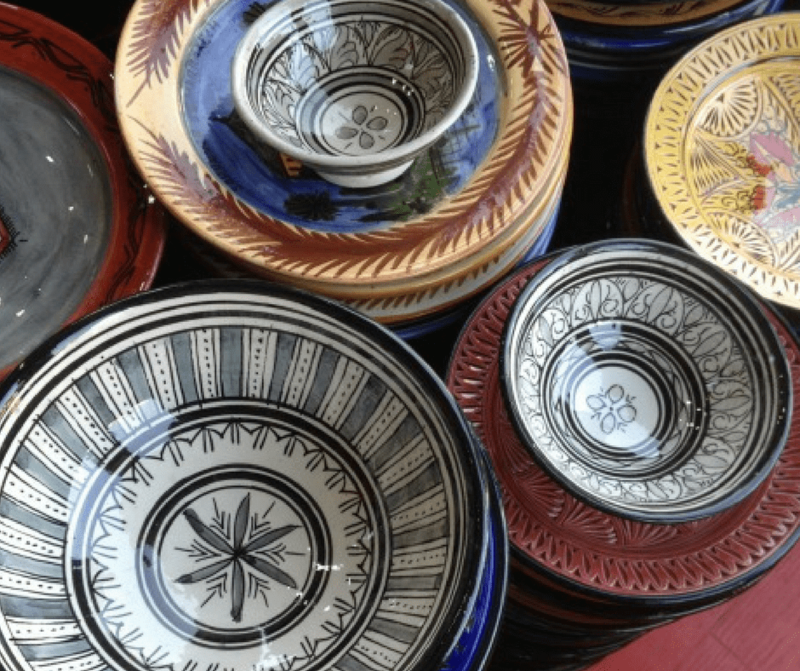 The cities of Safi, Fez, and Meknes are best known for their pottery and designs. Price Moroccan ceramics: Small bowls can cost as little as 20dh. For larger pieces up to 200-300dh. The price for a Moroccan tajine, without decoration, ranges from 20dh for a small tajine to 100dh for a large tajine. 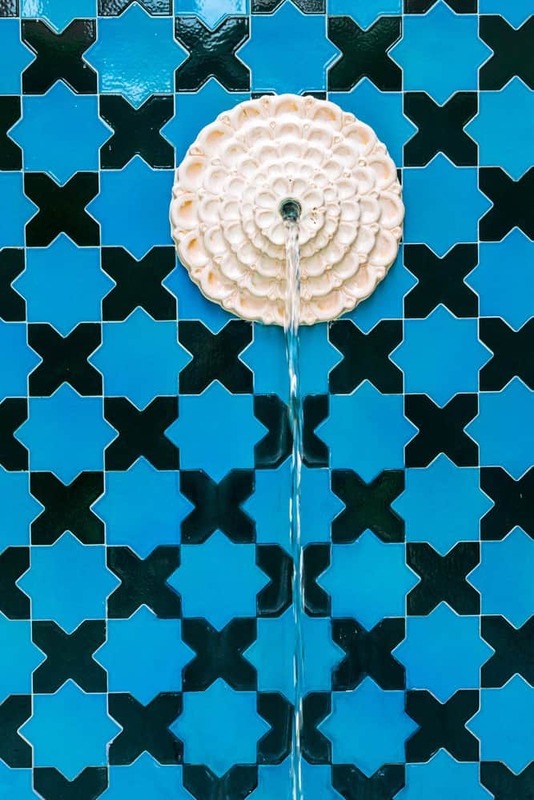 You can’t miss the traditional tilework that adorns most places across Morocco. While it’s a bit impractical to consider taking home a tile wall, smaller pieces of this intricate art are available for purchase. Moroccan tiles are a really unique craft. Traditionally each of the shapes is chipped by hand. It can take up to 10 years of apprenticeship before someone is considered a master tile maker. The design is created upside down; meaning the tile maker doesn’t arrange based on color but by memorizing the pattern and shapes, arranging them upside down and then sealing them. One mistake means the pattern is off. Just watching this at work is truly amazing! Prices of tile pieces: This is completely dependent on the item, size of the item and the pattern (how complex or elaborate it is). You can buy small tile wall hangings that may be a few hundred dirham or tile fountains that can cost thousands of dirham. It’s good to consider the amount of work that goes into each piece when looking at prices. Some can take weeks or months to complete. From fanciful dresses to basic djallabas, there are plenty of clothes to buy in Morocco. Many items are still handmade and very affordable. For women tunic tops and linen dresses are great purchases to make in Morocco. Be careful with bright colored items and wash separately for the first few times in case the color bleeds. Flowy kaftans are another popular item that can be worn when you’re home either around the house, outside, or as a pool/beach cover up. Men can find traditional and woven hats as well as well made tailored items if time permits. They too may be interested in a thobe that’s ideal for relaxing in the summer heat. One word of caution. Avoid purchasing items that you think look great on the streets of Morocco but might not bode so well when you’re home. While you may blend in great in Morocco, back home it might not be the same. Also look outside the souks. Many Moroccan cities have new districts with boutiques creating items that reflect traditional styles and patterns but have a modern appeal. These are really good choices if you like the colors or design esthetics of Moroccan style but want something that also can transition when you go home. Best locations to purchase: anywhere. You may see some difference in styles and designs based on the region. Prices of Moroccan clothing: Very simple kaftans can be purchased for 50-100dh (less if you find a good sale!) Shirts for 100dh, fancy takshita dresses can range anywhere from 1500-15,000dh! Today in Morocco leather is being made in much the same way it has been for hundreds of years. The famous tanning souks of Fez are one of the most photographed sites in all of North Africa and the techniques used haven’t changed over time. Leather is used to make any number of things, from leather bags to slippers, poufs to book bindings. You will find many different qualities of leather made with different types of skin including; camel, cow, sheep, and goat. The price of the product depends on the type of leather, the quality of the work and the item itself. Buying leather in Marrakech or just buying leather in Fez is ultimately the same process. Seek out a shop that either only sells leather or is a workshop making leather goods. They’ll offer the best prices and have a connection to the pieces. Don’t be afraid to ask for something slightly different or if you have time you can have things custom made. Typically it takes a few days to have something made custom (depending on what the item is). But, you can do it for far less in Morocco than in other countries even if you have to pay extra to have it rushed. If you know what you want come equipped with a picture or drawing to see what the artists can do for you. 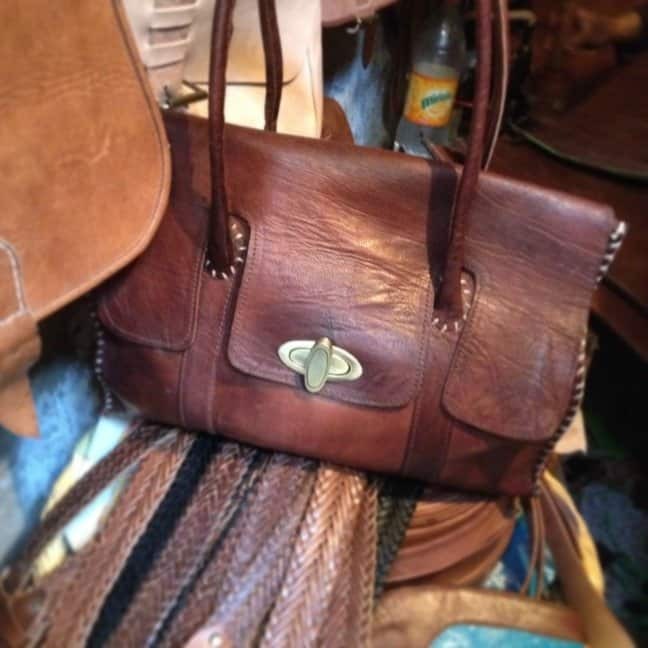 Price of leather goods in Morocco: a medium bag (as purchased) 450dh. Leather slippers from 50dh. Leather jackets from 800dh – 2500dh. Remember if you have time many products can be custom made in a few days. A handmade Moroccan lamp or lantern is a great souvenir to take home and be instantly transported back to Morocco each time you look at it. You will find a wide range of sizes, weights, and materials. Lighter weight lanterns are the most affordable but are typically made from aluminum. You won’t want to pack these in your baggage as they’ll likely bend and if you don’t have space to carry it on, paying to send it home may not really be worth the value. This lesser quality metal also tends to rust or discolor quickly. If you really want to bring home this type of souvenir invest in a more heavy-duty fixture. Metal lanterns with glass are suitable for indoor or outdoor display. For indoor use you can find metal cut lanterns as well as glass plated lanterns to hang. You’ll also want to pay attention to lanterns that come strung with the electrical fixture. In many cases you will need to rewire this to match up with your home electricity. Best locations to purchase: lanterns are largely the same across the country but you may find subtle differences between craftsmen and geographical locations. What to pay for a Moroccan lamp: There are two qualities to look for. The lightweight lamps you can expect to pay 100dh- 500dh depending on size and craftsmanship. For the heavier, metal lamps prices start around 300dh for small pieces to 1000-2000 dirham for large lamps. A long lasting tradition in Morocco is the creation of etched metal. Much of the work is on decorative pieces but is also found on more practical things like teapots, trays, and jewelry. The items that can be bought are a mixture of hand stamped and machine stamped pieces. A careful inspection should be able to indicate which is which. 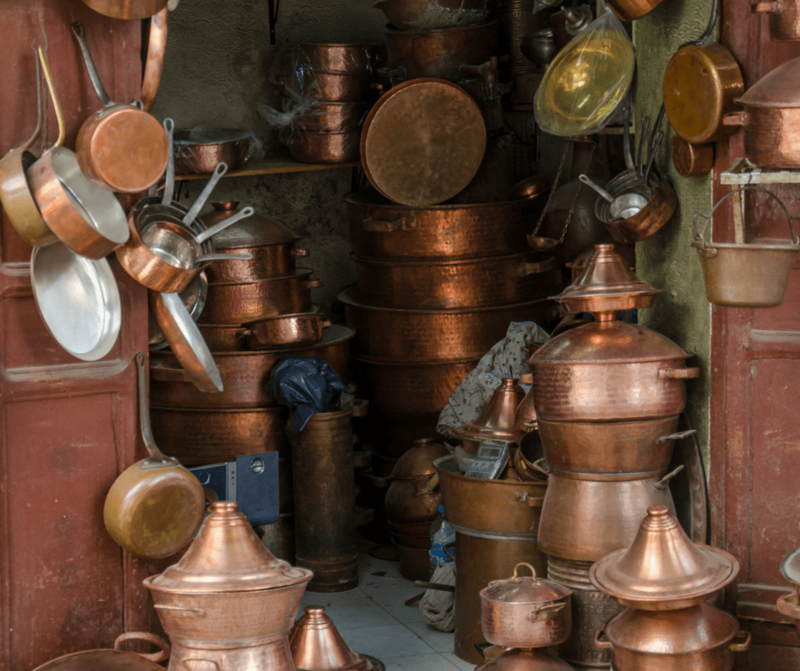 In the souks of most Moroccan cities you will be able to find workshops where metal items are being made. You can see which are done by hand and which are done by machine – though many hand made items do use a machine for some parts of the process. Hand etching is a very honored tradition in Morocco so if you’re interested in this type of souvenir seek out an artist who is doing the work in plain view for your purchase. Anything machine created will be uniform whereas even the best artist will vary slightly with his design. You can purchase brass, silver, and copper etched items. You also will find metal items that have been shaped and designed with a metal cutting saw; such as lantern designs and light covers. What to pay for metalwork: Handmade teapots range from 150-300dh. Etched plates 100-500dh depending on size and intricacy. Plain copper ware is less expensive than etched pieces. There are two primary types of instruments found in Morocco; Arab and indigenous inspired. The famous Gnawa musicians of southern Morocco introduced a variety of instruments to the spectrum. You can purchase oud’s- the traditional Arabic guitar across the country. For gnawa instruments head to the southern coasts or the Sahara to find authentic pieces and possibly even a lesson or two! The most common type of instrument you’ll see available for purchase are drums like in this picture. They are meant to be played with the hands and are commonly used in festivals and celebrations. They are relatively inexpensive to purchase a smaller size and make a fun souvenir for kids. What to pay: A drum like in this picture is about 100dh. You can purchase the hand cymbals used by gnawa musicians for 10-20dh a piece. Larger instruments will really depend on age and quality. The quality and flavor of spices from Morocco is much better than you’ll be able to find in most markets in North America and Europe. They also make an inexpensive and easy gift to transport. Saffron, turmeric, cumin, and ras al hanout are some of the most well known spices to purchase here. When buying ask at the shop if they will grind the spices fresh for you. The best spices to buy in Morocco are the spices that you will use – don’t purchase things just because it sounds appealing if you aren’t likely to use it. Some of my favorite spices include; cumin, cinnamon, paprika, and white pepper. The flavor of all of these is so much more intense than what you can find in a regular grocery market. Other food items include almonds, walnuts, figs, dates, and olives. Argan oil (culinary grade) is also a prized item. You can pick them up at nearly any hanout (the name for a shop) selling dried goods. Avoid shops that appear only to sell to tourists as you are sure to be heavily overcharged. You may want to wait until the end of your journey to purchase these items so they’re the most fresh. That is of course unless you’re somewhere that the spice is grown and sold – like saffron. Best locations to purchase: across Morocco. Saffron comes almost exclusively from Tailouine. Depending on the region and the time of year you may be able to get better quality. For example dates are harvested in November/December in the Sahara and almonds appear in early spring throughout the north. The most prized purchase for many visitors to Morocco? A rug, and for good reason! Moroccan rugs are beautiful and there are dozens of options and price ranges available. Even the most expensive rug bought in Morocco will be far less expensive than if it were purchased in the United States. This is one purchase you may want to save until the end of your trip. This will give you the opportunity to see what is out there and practice your bargaining skills- you’ll need them! While many purchases in Morocco can be done quite quickly, you should expect a rug purchase to take much longer. know many people are wondering how and where to get a cheap Moroccan rug. I wish there were a solid answer I could give you but there’s so much that goes into the making, procurement and sale of rugs that there is no easy answer. A lot of the price will also depend on how old the rug is, which type of rug it is and how big it is. The best way to get a good price? Be open minded, bargain hard -really hard, and be willing to walk away. Best locations to purchase: there are many different kinds of rugs, you’re more likely to find the best deals on the rugs that are local to the region you are in. Just a heads up, gone are the days of buying a $50 Moroccan rug. You should realistically plan to spend a few hundred dollars on a good rug. I’m breaking this down city by city (at least the major ones) in case you want a quick reference guide! 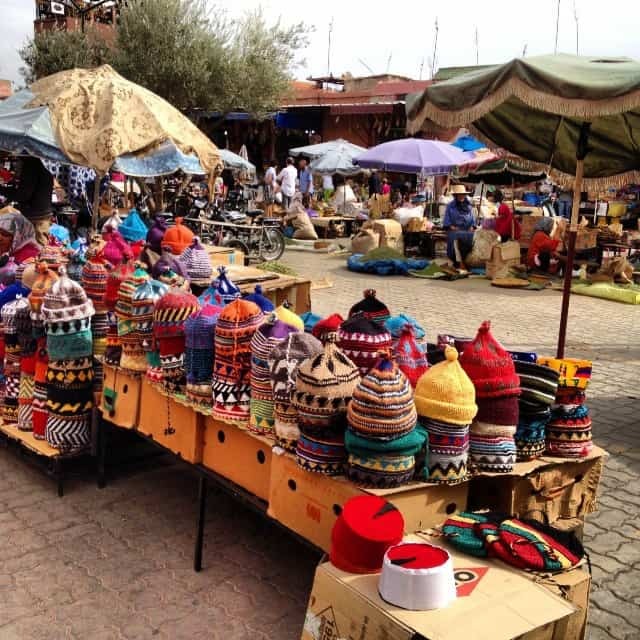 You can really find most everything in Marrakech because it is the tourist center of the country and also has been a cross-roads of trading for centuries. You may discover that prices are higher because of the high numbers of tourists but this also means you can likely bargain a bit harder to get lower prices. Tangier has a feel that is uniquely Moroccan and not really Moroccan at the same time. It was an international city for many years and as such has developed it’s own feel. You’ll certainly find Moroccan elements but don’t be surprised to find a little bit of everything jumbled together. antiques – thanks to Tangiers’ international status for decades you can find a little bit of everything! Fez has been an artisanal hub for generations and so it’s a very popular destination to buy traditional Moroccan handicrafts. Many traditions are still in place and the quality of products coming from here remains top notch. a Fez hat of course! The best thing you can buy in these places is argan, due to their close proximity to the argan growing trees of Morocco. But this part of the country also has a slightly different climate and traditions so you can find things that don’t exist – or would cost a lot more – in other parts of Morocco. Many tourists visit Casablanca on arrival in Morocco and while there is shopping to be found, the artisan markets just aren’t quite the same here. Rabat’s medina retains a traditional feel while nearby Sale (just across the river) has a market where bargains can be had. pottery – especially in Rabat where it’s made. antiques – harder to find a bargain but plenty remains from Moroccan history and the French occupation. Missed your chance and want to buy some things? 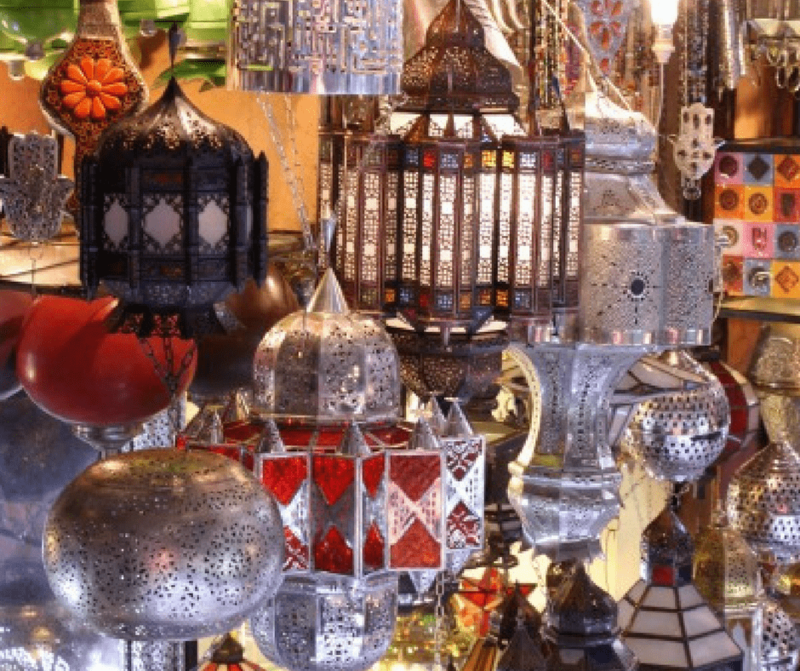 Here are 20 Morocco Inspired Gifts that will help you find Moroccan souvenirs online! With this information in your arsenal you’ll be on your way to bringing home the best souvenirs. Great tips! Do you have any idea where I can buy one of those “genie” lamps? Nowhere specific that I can think of but you’ll easily find them just about everywhere! Hi Amanda, nice blog here. I wish I’d seen it before arriving Maroc. I leave on Saturday. I saw a colorful ‘I love Morroco’ female t shirt, v neck on a friend’s video and I do not know where to look. I am in Agadir, but have not seen it in the souk, would remember if I did. Any idea where? Thanks. Thanks so much for your time to help us tourists out!! Are the prices listed on this article still applicable in 2019 or have they changed a bit?? Also, how much approximately is a pillow cover?? Thank you again!! Yes they’re accurate ( I regularly update this post) a pillow cover, depends on size/material/condition etc. I’d say between 150-400 dh depending on those things. Is there an area in the Marrakesh souks just for musical instruments? My son is interested in looking at some drums/drum-makers. Thanks! Not on a large scale but you’ll find music shops scattered throughout the medina. Hi Amanda! Do you have any recs for where to buy real saffron? I’ve heard there are many spice stores that scam you on this and so want to make sure I buy from somewhere credible! Thanks. I think the best tip is to just check the quality. Take a thread or two in your hand and crush it and it should make a brilliant yellow color. It also will have a distinct smell and should be slightly damp. If the saffron is crumbly and has no smell it’s not good. Hey thanks so much for all of this cool information. My father collects knives, so whenever I travel I try to find him one of the traditional knives for the area. 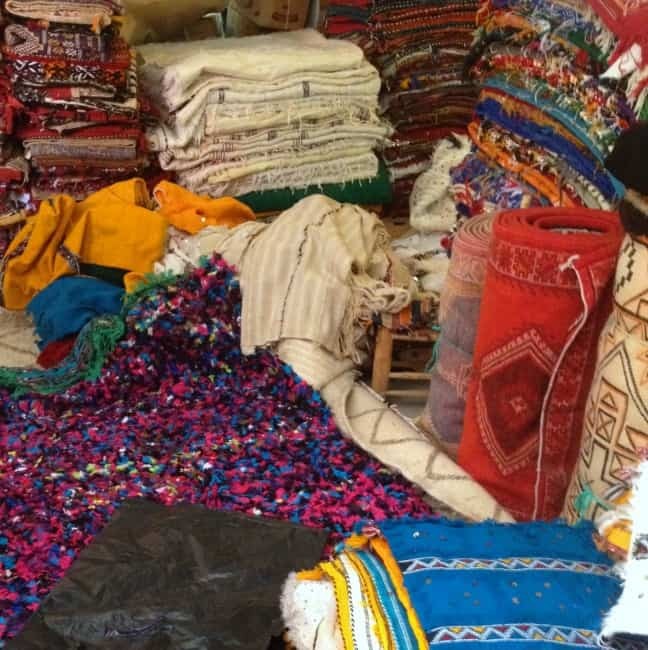 Do you know where you can get a traditional Berber khomiya or jambiya in Morocco? I’m sorry but I’m not well versed in knives I’m afraid. There are some shops that sell artifacts (antiques and more modern things) that might be your best bet. I saw some ornament handled knives in the big souk of the old Medina, Marrakesh. If you would go to the metal work part of the market. Beware, it is a huge place. Hope this helps. I’m sorry I’m not sure of any online shops in Europe that sell them! I’m sure there are but it would take some research. I am travelling to Fez in January and would like to buy Tayfers (containers for henna gifts for the bride). Where should I look for them in Fez? is there a shop? souk? stall? that I should consider? any idea on price? Also I would like to buy some muslim prayer beads and prayer mats – Is there a souk / shop / area that sell these and other religious things please? You can find all these things in the shopping area near the Karouine mosque – lots of shops selling them! I’ll be travelling to Casablanca in December & was wonder if you could recommend a cheap & safe way to get from the airport to my hotel. The train is the easiest if you have time. Trains depart regularly from Casablanca Oasis station directly to the airport. A taxi is also an option depending on your flight time but will be more expensive. The airport is about 20km+ outside the city depending on where you’re staying. First of all, great article – loved it. – 3 nights in Marrakesh- I will have the opportunity to go around every evening/ night. 1- For the time I have in Casablanca, could you suggest places to see or shops to visit, the likes of which, I would not be able to experience/ see, in Marrakesh. hi Amanda,i am going to Agadir with my 83 yr old mother on march 18 for a week,as we cannot travel too fare from the resort,is Agadir the best place to buy souvenirs. first time tourists to morocco. great website,lots of interesting information. You will find somethings but maybe not the best place for souvenirs. I would say stick to things that are from that local area; anything wooden, argan oil, and the like. Anywhere you see artisans actually doing work it’s a good option to buy directly there. Avoid shops that just sell a little bit of everything. Hi Amanda – I really enjoyed this read. I have a 20 hour layover in Casablanca and I’ve booked a room at the Sofitel. I will be there Fri night – Sat late afternoon. I really just want to shop and see beautiful decor. I am very rusty on my Egyptian Arabic, same for French. I’m an American female travelling solo. Can you suggest what I can do/plan or where I can go to optimize my trip experience and minimize overly touristy experiences? I love tea, hookah, clothes, textiles, decor, vegetarian food, art … would love to take in a traditional-type event that night maybe? Any help would be VERY appreciated. I’m definitely looking for a 2-person tea set glass/metal/ornate. Are taxis to be trusted? Should I find a taxi driver and hire for a tour? Will the beach be worth a visit in early Feb? Hi Michelle, I’m so sorry this comment got buried in the spam. I think by now your trip is over but I hope you had a great time. I’ afraid I don’t know Casablanca that well to be able to offer advice here to others reading. I’m going to work for two months there and I don’t speak moroccan or french. Would that be fine to speak english? And do you think i can make friends with other girls/ladies? Hi – it will depend on where you are going to live but only speaking English will be difficult. I’m sure you can get by for a short period and probably pick up some Arabic and French along the way. You might make friends but again it’s so short of a time it may be difficult, again depends where you’ll be. Hey! This is so helpful. I’m traveling to Tangier in January with the intention of looking for rugs. What is a reasonable price for area rugs? Also, how did you ship them back? Hi Christina – this is really hard to give advice on as a lot of it really depends on the style of rug, how old it is, how big it is etc. My best advice is take whatever price they start with and cut it by 2/3 and begin negotiating. If you have a figure in mind that you’re not willing to pay more than, stick to it! I thought of visiting Morroco for 4 days only, where is the best place to stay and visit. Am a muslim, love to see sights and shoppings. I am from Singapore. Anywhere where the hotel is near market, shopping and restaurant. Any a day or two city tour available? Thanks. I think you’ll want to choose one city for a short time. Marrakech is more touristy. Fez is more spiritual. There are also many smaller cities to consider. Will you fly into Casablanca? If so then choose one city. Would love to buy a sheepskin rug large enough to cover my double bed. Would such a thing be available in Morocco? I bought one in Greece many years ago, had it lined and shipped home..Warm as toast! Would there be such an item in Morocco and where would I find it? I know you can get some really beautiful woven wool blankets that would cover a bed but have never seen a sheepskin itself that large. Hey Amanda love your website I’m going to be in Marrakech on May 28. Would you know how much it is to send like a 5 lbs box to the states? I want to buy some leather goods and dishes but we are traveling for another 6 months so I don’t want to carry it. Thank you!! Hi – sorry for the late reply. It should be about $50 – ask for the slower shipping if you don’t need it right away (only like a week longer), it will save $$. Oh, also, we are planning on renting apartments. Is this a good idea for accommodation or is there a more cost effective way to stay in Morocco? We’d like to be comfortable but also not spend too much money as we’d like to shop and do things and eat, haha. We are from South Africa. My boyfriend and I are traveling to Morocco in Feb 2017 to celebrate our anniversary and plan on visiting Marrakech, Fes and Casablanca. This shopping post was really helpful. Are there any exciting activities we may do besides the camel riding (this is on the list of course). Hi — well just as an aside I’d skip Casablanca and maybe go for Rabat instead if you’re looking for a 3rd place. I would say to certainly look into staying in riads in Fez and Marrakech – there are many very nice riads that are still very affordable – and often less than apartments. Camel riding….you can do this kind of in Marrakech but it’s not the desert so if you are after that authentic experience you’ll want to go to the Sahara. 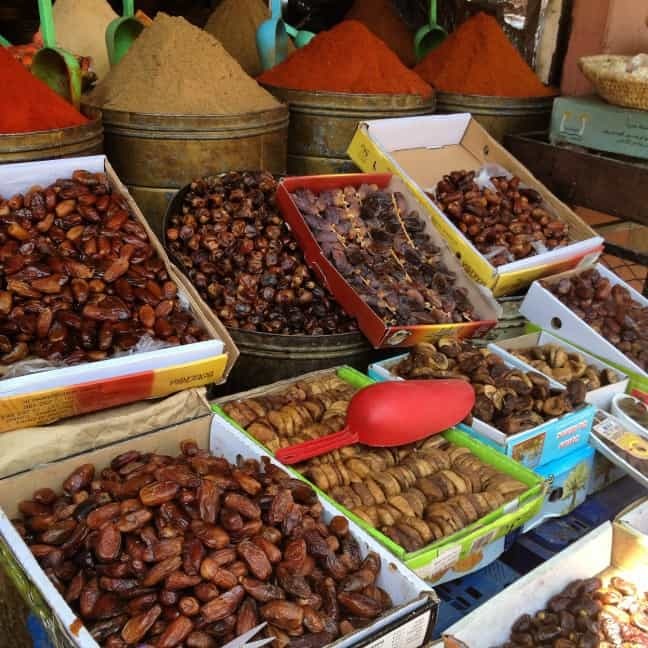 (maybe consider doing Fez – Sahara- Marrakech – or vice versa instead) You might also think about doing a cooking class in either of those cities. Drop me an email via the contact form with the things you like to do and I can send a few other ideas. 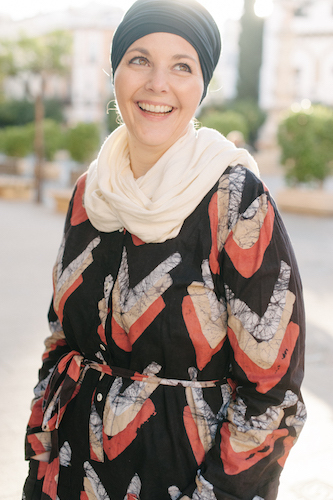 I’m travelling to Morocco next week and I’m just loving all of your posts – so helpful and informative! I was just wondering if there was a particular city you’d recommend for buying leather items – bags, purses, backpacks etc. I know you mentioned Fez, Marrakech and Rissani but I’ve been reading a lot of forums and the general consensus from tourists seemed to be that leather is better in Marrakech than Fez. Have you found this to be the case or would it just be that there is different types of leather being sold? Also is there anywhere you would recommend for cotton or embroidered items – table linens, bed spreads and the like? Personally I don’t really think there’s a big difference between the two. Fez is actually more well known for leather than Marrakech. I think you just need to pay attention as there’s lots more options in Fez. Buy away from the tanneries, buy only in shops selling leather products and do a close inspection. Embroidered things…again anywhere but I have seen more in Marrakech – check out al Kawtar a co-op that helps disabled women learn to embroider and then they sell their products. I’m from Canada and have been following your instagram for a few months and just discovered your website! I’m curious if you have any pointers for determining the quality of a rug and what to look for. My husband and I are travelling to Morocco in early February to celebrate our nuptials and think this would be a priceless memento to remind us of our trip. Hi Amalia, You should be able to tell pretty easily by looking at them. The weight and how tight the knots are usually give a good indication. I would look for brighter colors as it means that it hasn’t been “aged” on purpose. If you want to, it’s worth buying the lamps that are a bit more heavy duty and not the light weight variety. I’ll be travelling to Morocco in May and will definitely be picking up at least one rug, what price points should I be considering? Just to be aware of what is a good price range to bargain within? This really varies depending on the style, size, and age of the rug. It’s impossible for me to give even an estimate with so many variables. They can start for under 1000 dirham for a small rug and go well over 20,000 dirham for larger, more rare rugs. You will need to bargain and should prepare for a lengthy process. You’ll want to offer at least half (if not less) than the first price they give you). Thank you for this great information! I didn’t see anything specific to Tangier. What types of things should I look for there? Thanks! That’s a good question Jayne. Right now I can’t think of anything off the top of my head that is specific to Tangier. But, we’re planning a trip up that way soon so watch for posts dedicated to Tangier soon! salaam marocmama, i love reading this article. it gives me insight view of what i might encounter in my trip to morocco. insya allah and thanks for the time you put up. i have question, standard arabic spoken example, saudi arabia vs arabic spoken in maroc, does it make any much differences? Moroccan people will understand MSA but most people who speak MSA can not understand Moroccan Arabic. Most all Moroccans can however speak MSA so if they see you’re using that then they will use it. Will stores ship home to the United States or how do you recommend bringing larger pieces home, like a rug? Yes most places will ship things home. You can also mail yourself from the post office but it’s worth having the shop ship them. Morocco is one of my favorite places! I really liked this article. It makes me want to go back! Hi, does anyone have recommendations for reputable stores in Marrakech to shop for carpets? I know Marrakech may not be the optimal place to buy carpets, but that is where I am going to be and I’d appreciate any leads as to dealers who have a good inventory, are knowledgeable and honest in their dealings with clients. Any leads appreciated! Hi Louise, I’m going to be writing a post that lists some of my favorite shops but to be honest they seem to mostly be a dime a dozen. They all tend to work together in some capacity (like if you want a rug they don’t have they’ll find it for you and negotiate for the “owner”. Hi there! I’m from Portugal. I’ve been in Marraquesh in November 2014. I simple love your country. I’ve learn a lot with your notes. I just stay for a week but i want to return soon. I made some friends in marraquesh, the morocann people honor a lot there words. i felt at home. It’s strange but its true. i could live im morocco. 🙂 the food, the spices, the smells, the colors! We went to essaouira by bus. It was an adventure 🙂 We have eaten in small restaurants we look the places were morocan people eated. it was funny, i had the chance to eat fresh fried fish, harira soup, snails and other delicious food. we went to this vegetable market and we eated with locals. amazing!!! i both some spices and cumin black seeds for sinusite. Some arnica oil and of course argan oil. I love Maroc!! I love reading your posts, they’re so helpful! 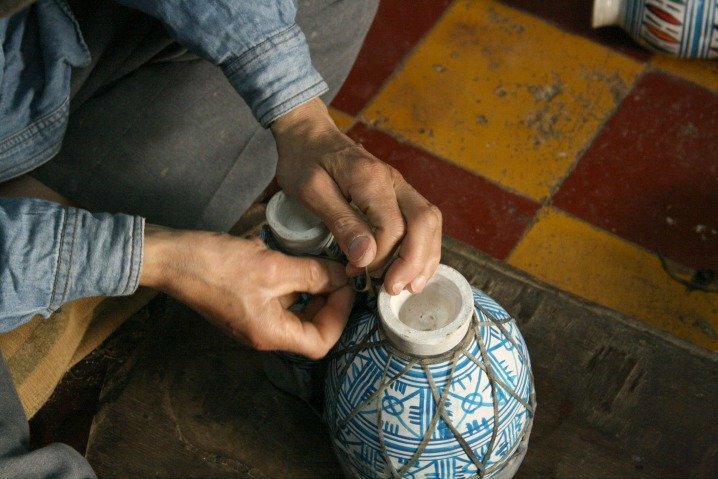 I am planning a trip to Marrakech in February and was wondering if you knew of a place where I could make a small drum. Also will I be able to buy Argan oil hair products in Marrakech also? Do you know of a good place? Hi Whitney – I’m not sure of a place where you can actually make the drum but know there are several places to purchase them already made. Argan is just about everywhere. Off the square in the northwest corner is a street that has shops selling nuts and dried fruits. Go there and ask in the shops for argan. We’re going to visit Morocco in March (first time). We know it is very important to negotiate and even fun, but it would be helpful to know where prices are approximate. Hi Jennie — I thought about adding prices but it’s really too hard because they will vary greatly depending on where you are, what the quality is, what the materials are etc. With shopping just remember to cut the prices by 2/3 to start and then go from there. Check out my Morocco section, there’s loads of articles on traveling in Morocco! Morocco is shopping heaven! We still have a pair of pointy toes goat skin slippers stashed away somewhere.